Adipura Park is located in the heart of the city, faced to the Great Mosque. Adipura Park is surrounded with various kinds of plantations. It is a place for taking a rest in the evening, suitable for family recreation, and enjoy regional foods like Bakso, Fried Rice, Fried Noddle, Sate and Kaldu. In the morning at about 6.00 am till 8.00 am, it is usually full of young people or youth to take a walk around, especially on holiday and Sunday. 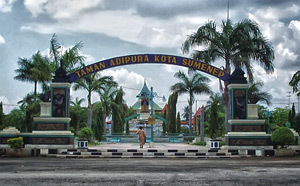 Adipura Park is kind of city tour in Sumenep that is Sumenep gardens directly opposite the great mosque. The visitors can spend their tired day here with enjoy the fresh and the green tree around the park. There many merchants here, such as; merchants of foods, toys, accessories, etc.